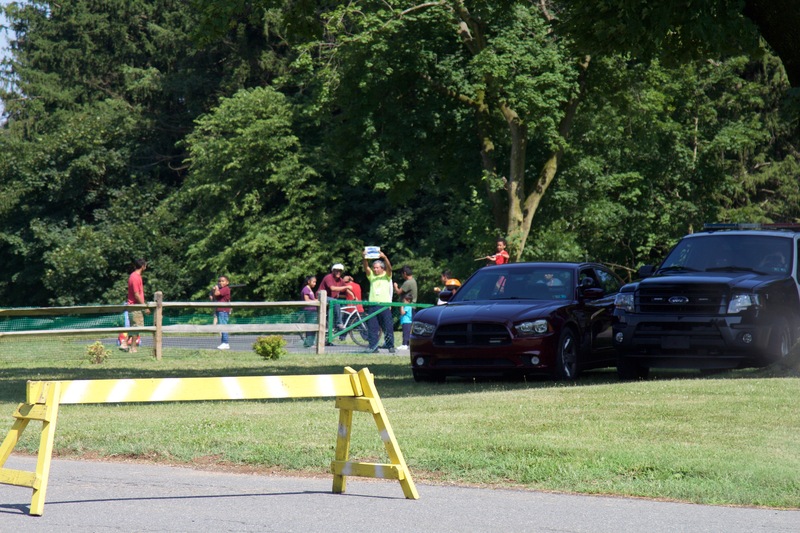 Approximately 17 protesters from the Shut Down Berks Coalition were arrested Sunday afternoon for blocking an entrance to the Berks County Residential Center in Leesport, PA, where around 20 immigrant families are currently being detained as their requests for asylum are being processed. Protesters and demonstrators called on Gov. 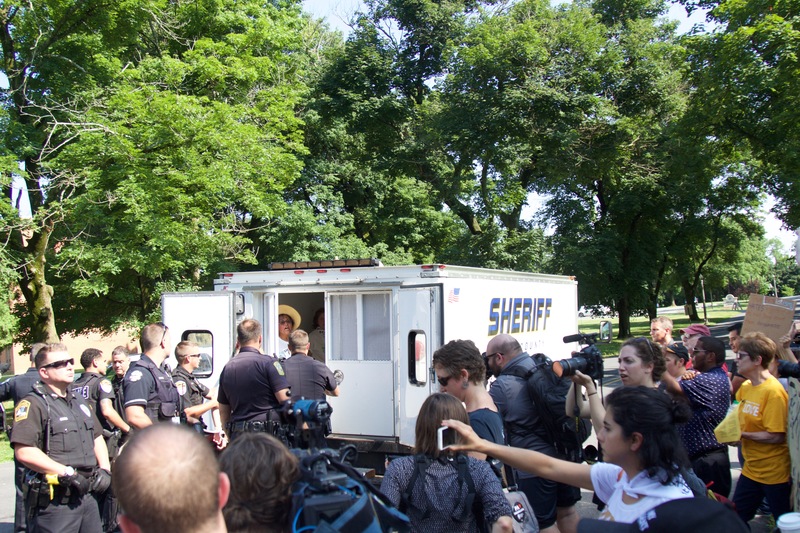 Tom Wolf to shut down the family detention center, one of three in the country, with an emergency removal order. 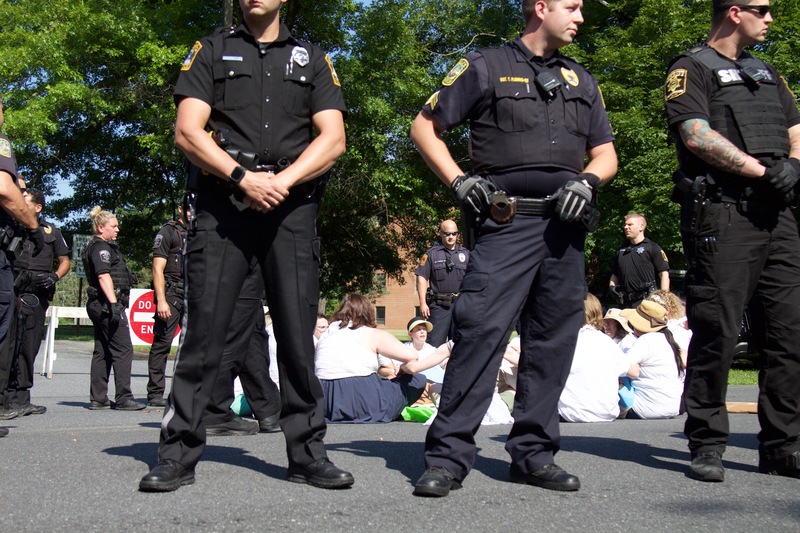 The demonstration, in which nearly 20 people linked arms and sat down in the driveway of the center, had been planned by the Shut Down Berks Coalition as a separate action from the monthly vigil, organized by Shut Down Berks Interfaith Witness and the Friends (Quakers) CALN Quarterly Meeting, which took place several hundred feet away. 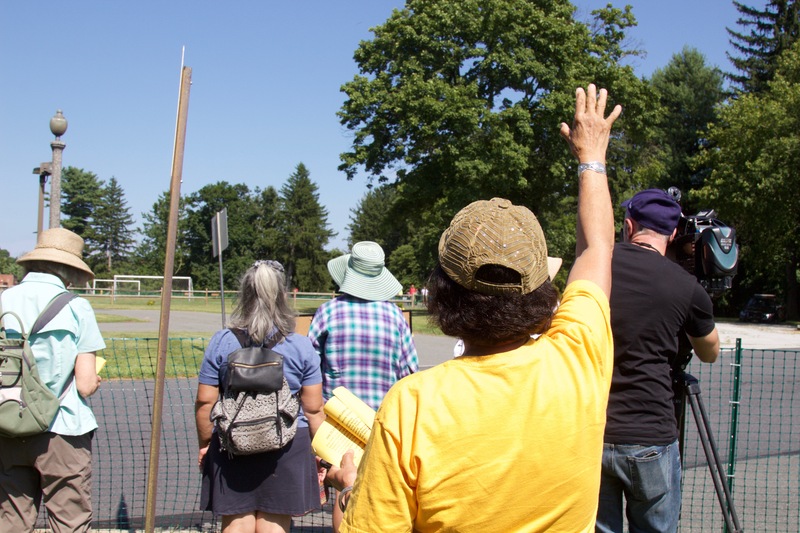 At the vigil, stories from the families inside the detention center were read, and some of the more than 100 people gathered there waved and shouted greetings in English and Spanish to a few of the detained families who were visible in the field attached to the detention center. 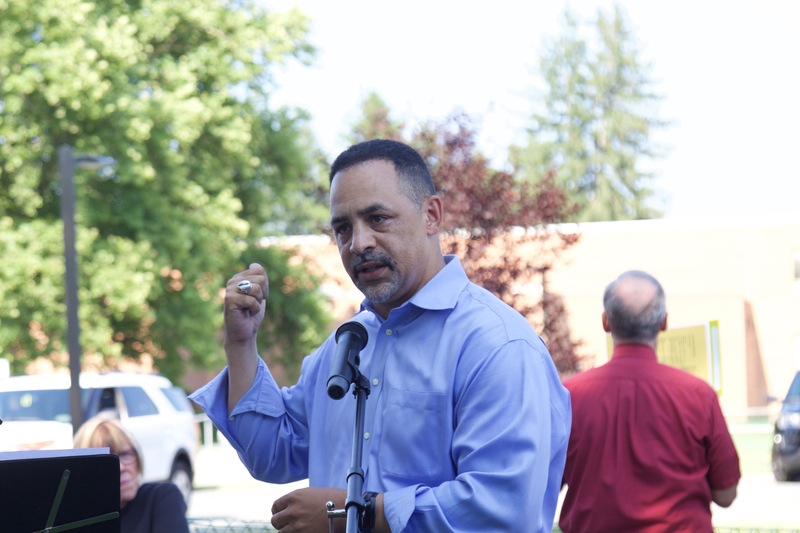 State Rep. Chris Rabb spoke at the gathering, noting that he had recently visited the Berks County Residential Center, which he referred to as "a prison" since those detained there are not allowed to leave. "I saw small children in there. I saw fathers in there, I saw people who spoke neither English as their first language, or Spanish as their first language. I saw indigenous people in there, who were fleeing their country of origin. I was deeply distressed,” Rabb said. 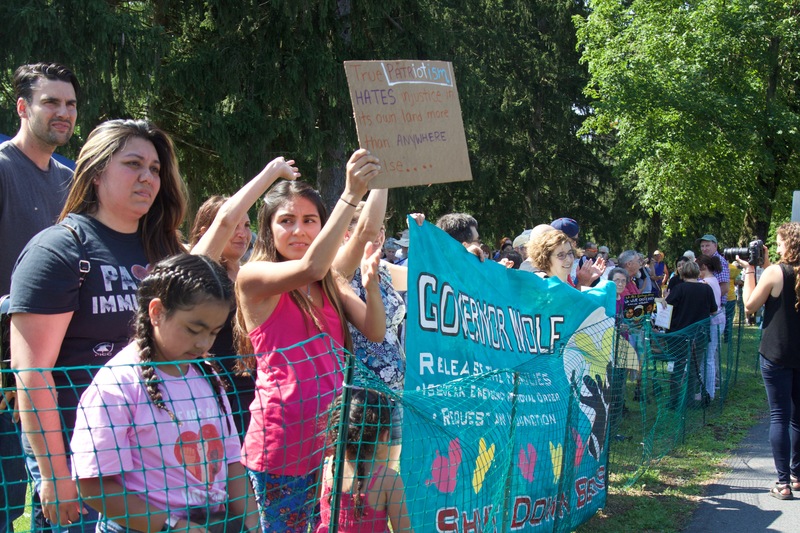 Armando Jimenez, a representative of the Shut Down Berks Coalition, said that they would continue to call for Wolf to issue an emergency removal order to effectively shut down the center, which is operated under a contract between Berks County and Immigration and Customs Enforcement (ICE). Protesters say that the immigrant families “should be allowed to be free, wait for the court date, and see a judge, go through the process but not behind bars,” said Jimenez, adding that the families detained at the center are not a threat to society. 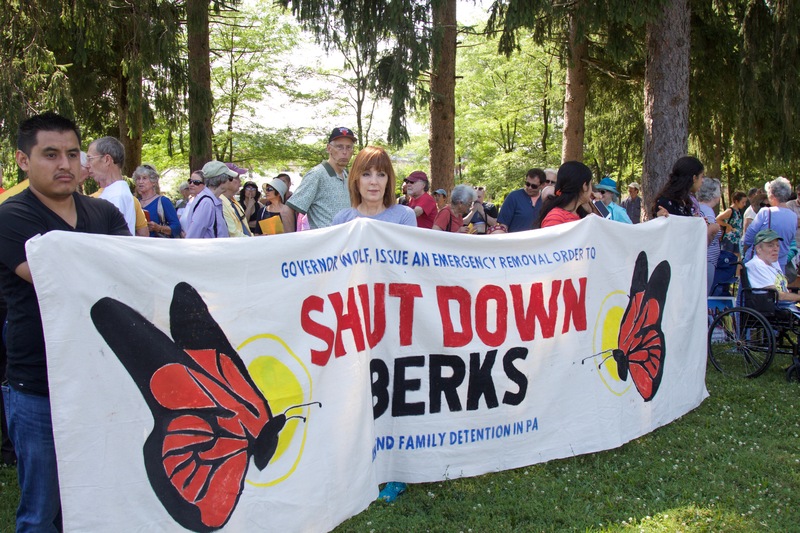 A video from the Shut Down Berks Coalition includes the testimony of a father who was formerly detained at the Berks detention center and is calling for its closure. Meanwhile, support for shutting down the center continues to mount as part of the demands presented by immigrant rights organizations and protesters in the Families Belong Together march and Occupy ICE encampment at City Hall. In June, the Philadelphia City Council passed a resolution calling on the governor to close the detention center immediately, as Rep. Chris Rabb and other state representatives have also supported the movement to close the center. On Monday, the Philadelphia Inquirer published an editorial urging the shutdown of the center, suggesting that Wolf take steps to fund immigration lawyers for the families being detained there, and that the county, which has struggled with drug overdose and addiction, consider converting the 96-bed facility into a drug treatment center.